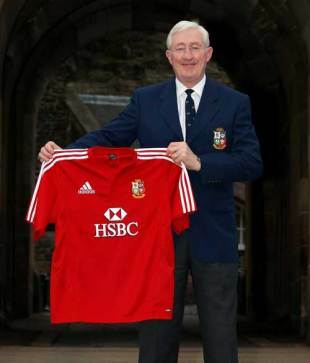 Former Lions No.8 and coach Jim Telfer has called on current head coach Warren Gatland to not overlook the claims of either Justin Tipuric or Ross Rennie as open-side flanker on the Tour of Australia. Wales captain Sam Warburton is the leading candidate to wear the number seven jersey when the Lions begin their Test campaign against Australia in Brisbane on June 22, though England captain Chris Robshaw has recently forced his way into the reckoning following England's victory over New Zealand in December. "I think that Warren Gatland has a few players that fall between the six and seven role, Chris Robshaw is one and Sam Warburton another," Telfer told The Rugby Paper. "If you look at Robshaw he started life at six and only moved across in the last couple of years and I don't think Warburton really falls into the role of seven either. "Justin Tipuric is as good as you can get at a genuine seven in Britain and I'd say Ross Rennie, although a little injury-prone, is the other player in that mould. Telfer was forwards' coach on the victorious 1997 tour to South Africa when he made the surprise selection of Paul Wallace and Tom Smith as Test props over the more-established Jason Leonard and Graham Rowntree. He also chose Richard Hill as his open-side for the first two Tests, then replaced him with Neil Back for the third and Telfer would like to see someone in a similar mould to the former England flankers given the chance to nullify Australia's David Pocock. "I would liken them (Tipuric and Rennie) to the All Blacks flanker from the Seventies Graham Mourie, in that they provide that link between forwards and backs," he said. "Warburton and Robshaw don't really provide that linking ability and that's why I don't think they really fit in with what you need. They don't really offload like you would want them to. Tipuric and Rennie maybe don't have the strength of a Richie McCaw, but I would like to see them given the chance."